Pápai Páriz Ferenc, Album amicorum p. 237. Oxon[iis] April. 30º st[ilo] vet[eri] MDCCXVI. * Ovid, Fasti 1.493: “omne solum forti patria est, ut piscibus aequor”. Edmond Halley was born on November 8, 1656 (by the old calendar, on October 29) in the village of Haggerston near London (Shoreditch), the son of the rich soap-maker Edmond H. He studied in St. Paul’s School in London, and from 1673 in Queen's College Oxford. At that time he already mastered Latin, Greek and Hebrew, and took astronomical measurements and calculations. Some times he visited in Greenwich the royal astronomer John Flamsteed (1646-1719) who was working on a new catalogue of stars on the basis of the most exact measurements of the period. This intrigued Halley, who proposed to do similar measurements also on the southern hemisphere. In November 1676 he broke his studies, and with the financial support of his father and with letters of recommendation of King Charles II he sailed on a ship of the East India Company to the island of St. Helena, the southernmost point of the British Empire on the Atlantic. In spite of wrong weather he managed to determine the exact coordinates of 341 stars, to observe the transit of the Mercure in front of the Sun, and to try pendulum experiments. He set off for home in January 1678, and at the end of the same year he published the first catalogue of southern hemisphere stars. At this time he received M.A. degree on royal command, and in November he was elected member of the Royal Society. From 1713 he was the secretary of the Society, after having edited its Transactions between 1685 and 1693. It was in 1684 the first time he visited Newton in Cambridge. At that time the problem of the movement of planets stood in the forefront of interest. The laws by Johannes Kepler (1571-1630) were already generally acknowledged, and now three members of the Royal Society, Halley, Sir Christopher Wren (1632-1723, builder of St. Paul's Cathedral in London) and Robert Hooke (1635-1703, discoverer of the law of elasticity bearing his name) parallelly researched the force keeping the planets in their orbit; Wren even set a prize for the solution of the question. Hooke and Halley had already calculated that the force was inverse to the square of the distance between the planet and the Sun, but could not conclude the orbit of the planet. At the visit of Halley to Newton this latter disclosed to him that he had already achieved a mathematical proof that the orbit concerned was elliptical. Encouraged by Halley, Newton exposed his theory in his great oeuvre, the Principia, cured and published by Halley in 1687 on the commission of the Royal Society and on his own costs, also settling the dispute of precedence between Newton and Hooke. In 1686 he prepared a map of the world showing the prevailing winds over the oceans. It has the distinction of being the first meteorological chart to be published. In 1693 he published the mortality tables of the city of Breslau (Wrocław), in which he was the first to attempt to relate mortality and age in a population. In 1698-1700 he sailed to the southern part of the Atlantic, and on the basis of the measurements by himself and others in 1701 he published the first charts of the variation of the compass in the Atlantic and Pacific oceans, giving the first charts with lines of equal declinations plotted. In 1704 he was appointed Savilian Professor of the chair of geometry at the university of Oxford. (Sir Henry Savile (1549-1622) was a scholar of ancient science, a traveller and the Greek professor of Queen Elisabeth I; he founded the chair of geometry and astronomy in Oxford in 1619.) 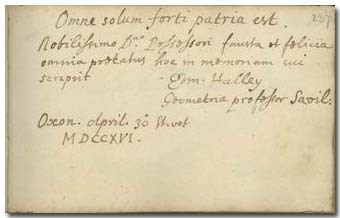 Halley here translated from Arabic to Latin a text by Apollonius, and reconstructed his lost books on the basis of Pappus; he also edited Ptolemaeus and other ancient authors. In 1705 he deduced from the Newtonian laws of cometary orbits that the comet appearing in the years of 1531, 1607 and 1682 is one and the same, which will return the next time in 1758. It was in fact observed at the end of 1758 with a perihelium in March of 1759. This comet was later named after Halley; its period of revolution is about 76 years, recurring in 1835, 1910, 1986 (its next return is waited for 2062). In February 1721 Halley succeeded Flamsted as Astronomer Royal. He died in Greenwich on January 14, 1742, and was buried in the nearby Lee, in a common tomb with his wife Mary Tooke (?-1737). His great merit was to have uderstood the results of Newton, and also applied them on the movement of the comets; to have published the Principia by Newton; and to have tested the new scientific data in the practice, for example in navigation. Some of his most important works are: Catalogus stellarum australium … London, 1679. – An estimate of the degrees of mortality of mankind drawn from curious tables of the births and funerals at the city of Breslaw. London, 1694. – The description and uses of a new and correct sea-chart of the whole world, shewing the variations of the compass. London, 1700. - Astronomiae cometica synopsis. London, 1705. Halley in his note written in the album of Pápai Páriz indicates his title of Savilian professor of geometry. Isaac Newton had also made his note in the album of Ferenc Pápai Páriz on p. 109.